den August 21, 2015, 1:09 p.m. 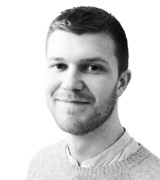 It's a controversial area with people rightly keen to avoid gender stereotypes, but now new YouGov research can offer some data behind how often different types of people cry. It is safe to say that women – especially younger women – really do cry a lot more than men. 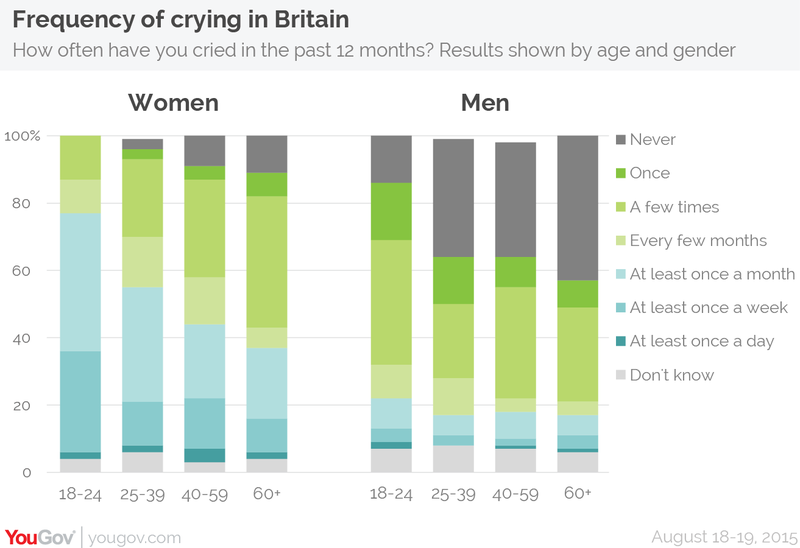 There is a huge difference in how often men and women have cried over the past 12 months. 34% of men say they haven't cried at all in the last year compared to only 7% of women, and 18% of women say they cry at least once a week compared to only 4% of men. When broken down by age as well as gender, the research shows a continuous downward slope, with even the oldest female age group (60+) crying more than the youngest men. 11% of older women haven't cried at all in the past 12 months, compared to 14% of 18-24 year old men. The heaviest criers are young 18-24 year old women – about a third (32%) report crying at least once a week in the past year. Amongst men, 18-24 year olds are significantly more likely to have cried in the last year than older men (79% compared to 51% of 60+ men). The top reasons for crying among young people may paint a sad picture, as the the top three causes for tears are low self-confidence (44%) and unsourced anxiety or sadness (43%), along with the top national reason – crying at movies, books or other art. Of those who have cried in the past 12 months (74% of British adults), 37% say they've cried at a movie or book in the past year, while family difficulties (29%), other people's unhappiness (26%) and unsourced sadness or anxiety (26%) are also common causes for tears. Of those who have shed a tear in the past year, even 41% of the most hardened group (60+ men) have cried at a piece of film or fiction, and they are actually more likely to have done so than younger men – suggesting male emotions soften up to the arts as we move through the generations.